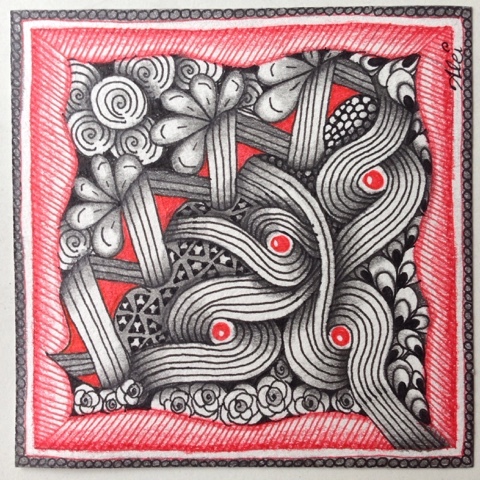 The Diva challenge this week (#272) is to make a tile using black, white and red. Laura had accidentally picked up her red Micron, instead of the black one, and so she finished her tile with these colours. And she turned her 'mistake' into a challenge - remember no mistakes in zentangle ! It was a nice challenge for me. I make rarely a couloured tile, but now for this challenge is was easy because you only had to use red as an extra colour. And I payed special attention to my shading here. Here are the patterns I used: Tripoli, Printemps, Sandswirl, Meer, Pea-Nuckle, Pozer, Antidots, Tipple. Very nice tile, nice border, nice tangles and nice combination, I like it!! !